It’s big – it’s colourful -- it’s the largest Easter egg in the world – and it definitely makes you wonder! Vegreville, Canada is the site of this spectacular giant. 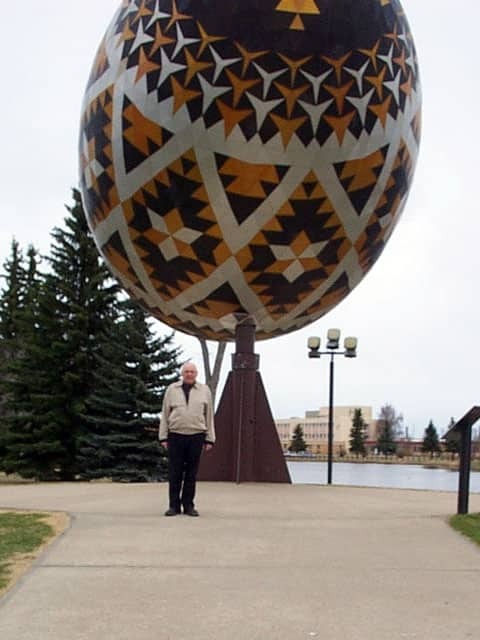 The Easter egg or Ukrainian 'Pysanka,' was constructed in 1975 in honour of the early Ukrainian settlements east of Edmonton. Thousands of tourists from around the world visit Vegreville annually and marvel at the Pysanka. It is one of the premier tourist attractions on the Trans Canada Yellowhead Highway. The Pysanka is really an immense jig-saw puzzle containing 524 star patterns, 3,512 facets, 2,206 equilateral triangles, 6,978 nuts and bolts, and 177 internal struts. Really, what more do you need?